of diversely themed and inspirational museums. The Berlin Egyptian Museum possesses one of the most important collections worldwide comprising also many objects from the Amarna period (around 1,340 AC). The bust of Pharaoh Akhn-aton's wife Nefertiti is probably most spectacular exhibit. Other remarkable objects are the portrait bust of Queen Teje and the "Berlin Green Head". Open: Sunday to Saturday from 10 a.m. to 6 p.m.
Thursday from 10 a.m. to 8 p.m. The ensemble of the Museums’ Island was completed by the construction of this museum (1910 - 1930) which became the completed most popular of all! 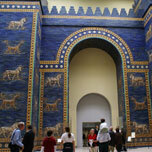 Under one roof, the Pergamon Museum houses some of the finest collections worldwide, including the archaeological collections of the Greek and Roman antiques section with the Pergamon altar (closed until 2019), the Middle and Near East section with the Ishtar gate from ancient Babylon as well as the museum of Islamic Art. The visitor sets out on a journey taking him 6,000 years back, through the history of the advanced civilizations of antiquity, some of them famous and well documented, others lesser known, but nonetheless fascinating. 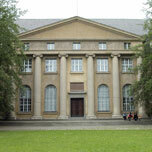 The museum, a work of Berlin’s most famous architect Karl Friedrich Schinkel, was built in 1830. It was the first of five museum to be erected on this island, later to be called the Museums’ Island, downstream from where the medieval town of Cölln and the roots of Berlin lie, opposite the Royal Palace that disappeared after the war. The antiques collection is distributed between the Pergamon and the Old Museum, the latter focussing on amphora and sculptures. It also has a remarkable collection of jewellery. Following the impulse of the Frankfurt national parliament, an artist movement began to call for a museum dedicated to German art. 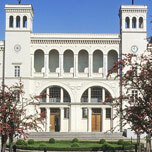 The museum was built from 1866 to 1876 according to plans by Schinkel’s disciple Friedrich August Stüler. The monumental statue in front of the building represents Prussian king Frederick William IV who died in 1860. The gallery’s collection spans the time from the German classical period to early modern painting, comprising romantic, impressionist and expressionist style. Besides the works of famous German painters like Menzel and Liebermann, French impressionists like Monet, Cézanne, Renoir and Manet are also represented. 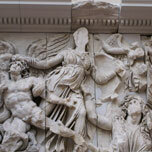 The picture is completed by the sculptures, featuring names like Schadow and Rodin. 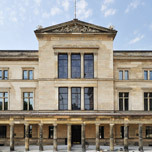 In this gallery you will find another collection of international importance Berlin can boast to possess: European art from the 13th to the 18th century including paintings by all the famous Italian and Dutch masters like Raphael, Tiziano, Caravaggio, Bruegel, Rubens, Vermeer and Rembrandt . Furthermore the collection, founded in 1830 and systemically enhanced since then, puts emphasis on German late gothic and renaissance painters, above all the works of Dürer, of which more are to be seen at the Museum of Prints and Drawing (Kupferstichkabinett). Six of the 72 rooms are dedicated to a distinguished selection of 18th century painting, presenting works of Canaletto, Watteau, Pesne and Gainsborough. and the Museum of East Asian Art. In the 19th century, a period of lively academic interest in extra-European cultures as well as public curiosity, many people started collecting objects from their travels and expeditions all over the world. These collections have played a central part in the encounter of Europeans with different cultural ways. Some of the famous German expressionist painters used to visit the Berlin museums and draw / take sketches of “strange” objects that fed their imagination, seeking inspiration by an art that was regarded as “primitive” at the time. Of course, the scientific focus has changed completely since colonial times and research tries hard to overcome eurocentrism. 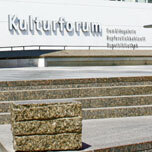 The modern museums’ centre, built in the 70s in the immediate neighbourhood of Berlin’s second-most important university, was completed in 2005 by the Museum of European Cultures, (formerly Museum of Folklore and European Ethnology). 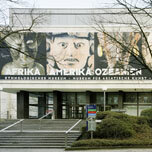 The museums are well worth a trip to Dahlem, a green district and residential area in the southern outskirts of Berlin. The German Historic Museum consists of two buildings: The Baroque Armoury, the oldest and probably finest structure on the Linden avenue, which houses the permanent exhibition and a modern extension, work of the famous American architect L.M. Pei, where temporary exhibitions on topics related to German or European history of the 20th century are shown. The aim of the permanent exhibition in the Berlin Armoury, which used to be a military museum at different stages of its history, is educational, but on a scale that has not been attempted before. More than 8,000 objects illustrate German history, starting from the first century AC until the present day. Although it probably will never be put into reality, Daniel Libeskind’s plan for the new towers on Ground Zero in New York has gained some fame But Berlin’s Jewish Museum is really the architect’s masterpiece. The building already attracted numerous visitors even when the rooms were still empty. Today it houses an excellent exhibition about the long and rich history of Jews in Germany whose presence goes back as far as to the 4th century BC. 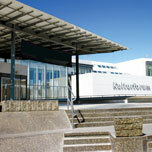 Since its inauguration in 2001 the Museum has become widely popular with Germans as well as tourists from abroad. People from all over the world contributed to the collection of mementos by donating their personal documents and objects thus adding life and enabling a more personal approach to the bare facts. In Berlin, Jewish families played an important part in the development of the city. Most of the times, relations between Jews and Germans were peaceful, until the rise of anti-Semitic ideology and its horrific consequences. The years of the Third Reich, when the Jewish population was diminished from 170,000 in 1930 to only 6,000 at the end of WWII, are also reflected in the exhibition. 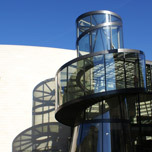 A museum not to be missed! Metro: Underground U1 and U6 Stop "Hallesches Tor"
One of the world’s finest collection of contemporary art is to be found in a former railway station building of the Berlin-Hamburg trail, closed down in 1884. 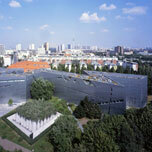 It was opened as a museum in 1996, after a thorough rehabilitation and extension directed by Berlin architect Joseph Paul Kleihues (1933-2004). On a space of 13,000 m² you will find anything created in the field of contemporary art of the last four decades: sculpture, design, video, music. Of course, artists like Warhol (Mao’s portrait), Rauschenberg, Twombly and Lichtenstein are also represented in the exhibition. Another good reason to visit the “Hamburg Station”: Since September 2004, the extraordinary private collection of Friedrich Christian Flick, with an exhibition space of 3,000 m², is also housed on the ground of the museum and will remain there for the next seven years. In the vicinity, the new Berlin main railway station has just opened. So now it is only a 5 minutes walk to the museum, from station to station..
On this ground lay the headquarters of central institutions of the nationals-socialist oppressive machinery. In the immediate neighbourhood of Hitler's New Chancellery the Gestapo, SD, SS and the Security Authority of the Reich were located between 1933 and 1945. After the war, only a few ruins remained of the buildings, forgotten in the shadow of the wall. Much later, the foundations of the former prison were excavated, the basement cells where prisoners had been questioned and tortured now lying bare. 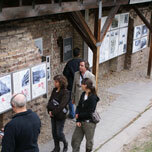 In the 1980s, a photo and text exhibiton was planned in order to show the history of the place where "germanisation" and mass extermination were planned. 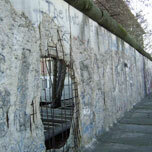 Just behind the "topography", lining Niederkirchnerstraße, there is a surviving segment of the Berlin wall. 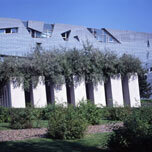 The museum with its characteristic silhouette was built after plans of Walter Gropius, founder of the Bauhaus. 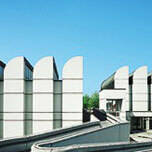 It is also a research centre for the Bauhaus movement, definitely 20th century’s most influential school of design. 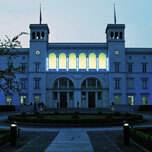 The archive, originally founded in Darmstadt in 1960, moved to Berlin in 1971. 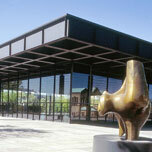 Although many famous architects, like Mies van der Rohe whose New National Gallery is just around the corner, emerged from the Bauhaus, it was not intended to be a school of architecture. The goal was to form a new type of artist beyond academic specialisation. Famous painters like Kandinsky and Klee were among the members. According to the ideas of the Bauhaus, the distinction between fine and applied arts, including handcraft which was regarded as the base of any art, should disappear. Besides the permanent exhibition which includes objects from all Bauhaus-promoted branches like ceramics, metalwork, furniture, photography and, of course, painting and architecture. There are also temporary exhibitions. Most historic buildings dating from Prussian times, i.e. the period of Hohenzollern reign, lie in the ancient part of Berlin that used to belong to the GDR. The palace of Charlottenburg is the most remarkable exception. Today it is hard to imagine, that Berlin did not reach beyond the Brandenburg Gate until the 19th century, Charlottenburg being an independent and wealthy town that owed its existence and its name to the palace. It was built around the year 1,700 as a modest mansion, then called Schloss Lietzenburg. After the elector Frederick had raised himself to kingship, it was amplified as a summer residence. When queen Sophie Charlotte died it was named Charlottenburg after her. Frederick the Great had another extension to the palace built. The palace was severely damaged by bomb raids in 1943. After the war, it was entirely rebuilt and reconstructed. You should take your time to discover the palace and its Baroque and English gardens. The chambers of Frederick I. and queen Sophie Charlotte in the central part of the building are worth visiting, as well as the New Wing, designed for Frederick II. by the architect Knobelsdorff, a close friend of the king. Open: Tuesday to sunday from 10 am to 6 pm not to be missed! English-speaking tour for individual visitors every Saturday 2 p.m & Wednesday 2.30 p.m.
CLOSED from 01.01.2015 for several years. 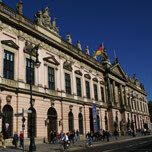 To assist you in preparing your travel to Berlin, this page lists the most popular cultural and leisure venues.